Wong Kar-Wai’s 1994 film Ashes of Time is a hypnotic meditation on themes of memory, loss, and identity, staged via newly created back-stories for characters from a classic of modern Hong Kong martial arts fiction, Jin Yong’s Eagle-Shooting Heroes. As many commentators have remarked,Ashes is perhaps the most difficult work in the oeuvre of a complex and idiosyncratic director. To the film’s difficulty—its perverse refusal to offer the narrative clarity and sentimental pleasures trafficked in by mainstream movies, and the demands it makes on a viewer hoping to wrestle any coherent level of meaning from the text—can be traced both its initial box-office failure and its more successful afterlife as an object of critical attention (though not unanimous approbation). Among the sources of the difficulty in which the film wraps itself are, first, its deployment in concentrated form of such directorial hallmarks as the radical disruption of narrative chronology, the omission of what might seem to be crucial information about characters and events, the presentation of incongruent information and viewpoints, and the privileging of visual and aural sensuality over discursive exposition; and, second, the cultural specificity of the material from which it takes its inspiration (i.e., the characters of Jin Yong’s fiction). Wimal Dissanayake’s examination of the film in Wong Kar-Wai’s Ashes of Time is invaluable for its address of at least the first of these sources of difficulty. 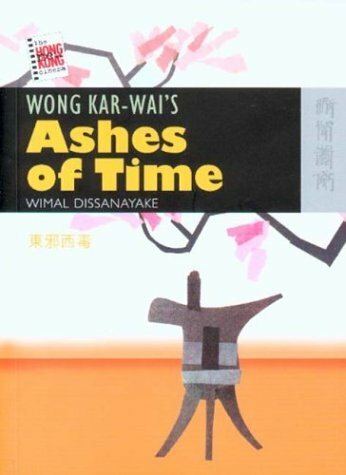 Wong Kar-Wai’s Ashes of Time is a volume in the New Hong Kong Cinema series published by the Hong Kong University Press under the editorship of University of Hong Kong Professors Ackbar Abbas and Wimal Dissanayake. Like the Film Classics series from the British Film Institute, the New Hong Kong Cinema series presents brief monographs focused on individual cinematic works: in addition to Dissanayake’s study of Ashes of Time, it includes to date Jeremy Tambling on Wong Kar-Wai’s Happy Together (2003); Karen Fang on John Woo’s A Better Tomorrow (2004); Andrew Schroeder on Tsui Hark’s Zu: Warriors from the Magic Mountain (2004); and Wendy Gan on Fruit Chan’s Durian Durian (2005). The general editors’ “Series Preface” places the project as whole in the context of an approach to Hong Kong cultural studies exemplified by Abbas’s Hong Kong: Culture and the Politics of Disappearance (Minneapolis: University of Minnesota Press, 1997). Film—at least certain films, or the work of certain directors—is seen as a key point of entry for the examination of a unique urban cultural space that emerged in the years between the signing of the Sino-British Joint Declaration in 1984 and the Retrocession in 1997, when a center of transnational culture and finance confronted the endgame in a monumental historical contest over sovereignty, and, as the preface puts it, “the problems of colonialism were overlaid with those of globalism in an uncanny way” (p. vii). Dissanayake makes Wong Kar-Wai’s film the center of a set of concentric exegetic circles. He undertakes to read the film itself—disentangling the strands of its narrative, characterizing its style, explicating its thematic and philosophical obsessions. He places the film in its historical context, describing ways in which its production and reception grew out of particular moments in the institutional history of Hong Kong cinema, in Hong Kong cultural history, and in the interplay between this culture and global cultural flows. He employs the film as a gateway to Wong Kar-Wai’s oeuvre as a whole, repeatedly stressing the ways in which it is both representative of and concretely intertextualized with the director’s other works. And he takes the film, the directorial oeuvre, and the cultural moment he views them as epitomizing an opportunity to explore (as all scholars and critics do) critical and theoretical issues dear to his own heart: “we have aimed to read Ashes of Time in terms of our own particular interests” (p. 145). More concretely, he organizes his study into twelve fairly brief chapters. After an “Introduction,” the second chapter, “Background,” provides a quick overview of the social and historical contexts of the film’s production and reception. Chapter 3, “Story,” summarizes the film’s narrative and plot and identifies some of its themes. It also plays with the idea that the story of the film’s own production (a “story” whose shaping narrator—the volume’s author and a certain critical community—is allowed to remain behind the curtain) somehow mirrors or is mirrored in the diegetic narrative. Chapters on “Characters,” “Narrative Structure,” and “Style” address component elements of the filmic text and further explore connections between this film and the director’s other works. The film’s relationship to its ostensible genre affiliation is the subject of Chapter 7, “Martial Arts.” Thematic and philosophical issues engaged by Ashes and the rest of Wong’s oeuvre are addressed in chapters on “Time,” “Melancholia,” and “Fragmentation.” Chapter 11, “Response,” surveys critics’ evolving evaluations of the film, and is followed by a brief “Conclusion.” The volume also includes two appendices (the first providing excerpts from interviews with the director and members of his crew, the second a chart of relationships between characters in the film), endnotes, filmography, and bibliography. In dealing with the challenges posed by Wong Kar-Wai’s signature directorial proclivities, Dissanayake judiciously divides his energies between providing a guide to the perplexed, on the one hand, and embracing the virtues of perplexity, on the other. Chapter 2, as mentioned above, offers “Background” on a wide range of contexts for evaluating the film: Hong Kong film in general; the martial arts film; the cinematic New Wave of the 1980s and 1990s; the political and cultural contours of the 1984-1997 period; Wong Kar-Wai’s life and oeuvre; the interconnectedness of the director’s works; the state of the HK film industry at time of the film’s production and release; the production history of the film itself; initial reactions and subsequent evaluation. The sketches here are brief, at times even cursory, yet valuable in establishing multiple strands of mooring for the enigmatic text. Equally useful is Chapter 3’s review of the “Story.” The abstract of the various elements of the film’s narrative provided here (supplemented by Chapter 4’s notes on the characters and Appendix 2’s chart of relationships) may come as a revelation to the viewer left dazed or annoyed by a first encounter with the film, or prove a godsend to the more determined exegete perched before a video monitor with a remote in one hand and a notebook in the other. That some details of the summary might be debated is only to be expected with a film so resolutely indeterminate. For resolutely indeterminate the film is; and any study that confines itself to “making sense” of Ashes of Time, restoring linearity and causality to its narrative and abstracting from the text a succinct thematic agenda, would be doing a disservice to the director and his audiences. Dissanayake is in no danger of committing such a fault. “[Ashes of Time] is a difficult film,” he asserts, “not because we cannot derive a meaning from it but rather because we are compelled to derive more meanings than we can comfortably handle” (p. 4). Among the strengths of his study are its insistence on the central role played in Wong Kar-Wai’s art by multivalence and uncertainty, and its enthusiasm for exploring the cultural resonances and philosophical implications of these characteristics. This strand of analysis runs throughout the volume and takes center stage in such chapters as “Narrative Structure,” “Style,” and “Fragmentation.” We find here a happy congruence between the obsessions of the director and the critic’s own agenda. It may be an exaggeration to claim, as Dissanayake’s language at times verges upon doing, that Wong deliberately “articulates” the views of the various theorists and philosophers the author cites in support of his readings. But it is undeniable that the director’s hypnotic visual style, non-linear narrative, thematic preoccupation with repetition and desire, and unquenchable fascination with the physical environment and cultural baggage of Hong Kong make Wong Kar-Wai’s work an apt vehicle for expounding that particular vision of Hong Kong championed here and elsewhere by Dissanayake and his colleagues—a vision of Hong Kong as the quintessential concretization in urban and cultural space of the psychic uncertainties and geopolitical ironies of postmodern existence. If Dissanayake excels in reading Ashes of Time (and through it, Wong Kar-Wai, and through Wong, Hong Kong) as a paradigm of postmodern “uncanniness,” he is less incisive, I think, in his account of some of the film’s specific cultural contexts. Wong and his work have attracted increasingly international attention while remaining distinctively tied to their Hong Kong roots. For international audiences, part of Wong’s appeal lies precisely in his ability to enunciate the global through the local, to speak in an idiom that is recognizably cosmopolitan and at the same time inflected by exotic particularities. For Hong Kong audiences, the particularities of his work carry meaning in a different way—not as the novel seasonings to what might otherwise be a generically transnational dish, but as the unremarkable stuff of a daily diet given unexpected savor through transposition and recombination. In many of Wong’s films, the distinction between these two modes of perceiving the local elements may not be terribly significant. The tropes of the Hong Kong gangster film exploited in As Tears Go By (1988) are arguably part of a universal language of genre. Chungking Express (1994) consciously defamiliarizes the Hong Kong of the 1990s, presenting it as an object of fetishization in the global cultural economy; and Happy Together (2000), with its fervid dream of the 1960s, performs a similar operation along the temporal axis. In the case of Ashes of Time, the stakes are rather different. Jin Yong’s novels, and the inexhaustible cycles of film and television adaptations they have spawned, are, in the words of the inescapable cliché, “the common language of Chinese the world over,” and are even more densely imbricated with the memories and imaginations of certain generations of Hong Kongers. This cohort’s experiences and horizons cannot be taken as constraining the meanings of Ashes of Time, yet must be accorded due weight as part of the emotional and hermeneutic apparatus of both the director himself and his historically primary audiences. A viewer who reads the film broadly as an exercise in the “kung fu” or “swordsman” genre, even if he/she recognizes (as who cannot?) the abnegation of some of the genre’s most hallowed features, misses out both on Wong’s specific manipulations of Jin Yong’s characters and on the deep well of familiarity and identification from which the director is drawing. The film’s protagonists—Huang Yaoshi, Ouyang Feng, and Hong Qi—are supporting characters in Jin Yong’s original novel. As three of the five reigning eminences of the Martial Grove (the world of the martial arts), they shape the martial and moral development of the novel’s central character, Guo Jing. Their gothic eccentricities offset Guo Jing’s simple-minded righteousness and add depth and shadow to the novel’s world; and even as they play their roles in the hero’sbildungsroman, their interactions with Guo Jing occasion the incremental revelation of the motivations behind their own extravagant personalities and implacable rivalries. Wong Kar-Wai thus engages in a dense and complex relationship with his source. His translation of the material from the mode of heroism and romance to that of melancholy and introspection ostentatiously subverts the genre’s emotional palette; yet this translation builds on plot elements and narrative strategies present in the original, and draws its power, both to fascinate and to alienate, from an already established intimacy between his characters and his audience. Dissanayake is aware of all this. He takes due note of the novels and their adaptations, describes the film as “both an extension and replacement of the original narrative,” and properly identifies Wong’s challenges to the “received” versions of the story’s characters as a source of audience dissatisfaction (see pp. 26-29). He is within his rights to decline “to undertake a full-scale comparison of the novel and the film, which would be a different subject altogether and demand a different forum” (p. 29). But the very general tenor of his remarks does little to illuminate this important element of the film’s meaning for the uninitiated viewer. A similar level of abstraction weakens his discussion of the genre of martial arts film. Chapter 7 offers an overview of the history of the genre and argues that Ashes of Time derives meaning from the simultaneous evocation and subversion of genre conventions. The point is valid; valid too, and necessary, is the point that other directors’ (King Hu and Tsui Hark, among others) elaborations of and challenges to the same conventions should prevent us from imagining “a simple opposition between Ashes of Time and the martial arts film genre” (p. 90). But the substantiation of these points once again remains frustratingly less than concrete. Here as throughout the volume, Ashes is characterized rather than analyzed (i.e., through close reading or shot-by-shot analysis), and held up for comparison against an amorphous “majority of martial arts films” from which little historical or textual particularity swims into focus. My quibble here—and it should be taken as no more than that—is that the volume’s provenance and the scope allowed by a monograph on a single film might have provided an opportunity not only to regard the film from the perspective of the informed Anglophone cosmopole, as Dissanayake does so well, but also to present a thicker history of the literary, linguistic, and cinematic particularities of the soil from which it sprang.